More than a year after the death of a diver for the Navy's Marine Mammal Program, the Navy contractor he worked for is fighting a fine and safety improvements. 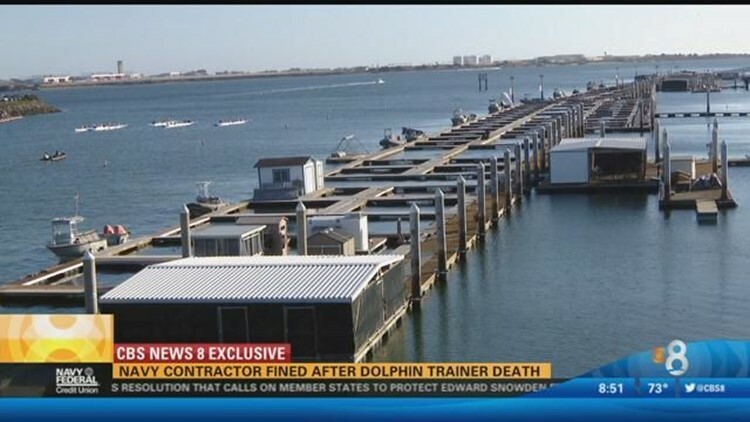 SAN DIEGO (CBS 8) - More than a year after the death of a diver for the Navy's Marine Mammal Program, the Navy contractor he worked for is fighting a fine and safety improvements. In April of 2014, Coll Perke drowned in San Diego Bay during a training exercise with dolphins and sea lions. Newly released documents show that in the wake of his death, Perke's employer, Science Applications International, was fined $10,000 for two serious violations. One for failing to maintain contact with Perke during a solo dive, and another one for not having safety ring buoys or ladders. More than a year after the violations were handed down, Science Applications is still appealing the decision. Just off Harbor Drive there are unassuming docks attached to Naval Base Point Loma. Most contain dolphins or sea lions used to support military missions underwater by finding underwater swimmers, mines or other items. A former trainer with the program is now calling for better safety procedures. Rick Trout used to train sea lions when the program was classified in the 1980's, but since then, he has become an outspoken critic. "This is truly a waste of taxpayer money and a total abuse. Everyone has gotten to go home except the dolphins," he said. While it does appear that new ring buoys and ladders are on the docks now, Trout said more needs to happen. "The fact that SAIC is appealing this decisions flies in the face of all the concern they had for Coll and his family and the rest of the program," he said. A spokeswoman for Science Applications said they would not comment on why the company is appealing during the ongoing litigation. There was also no comment on safety steps now in place. The Navy said it does not believe a dolphin caused Perke's death. Current estimates show it takes about $20 million to run the dolphin and sea lion program. The Navy plans to phase out part of the dolphin program in 2017, but other parts will continue. The Navy pledged to care for the retired dolphins after they are discharged.